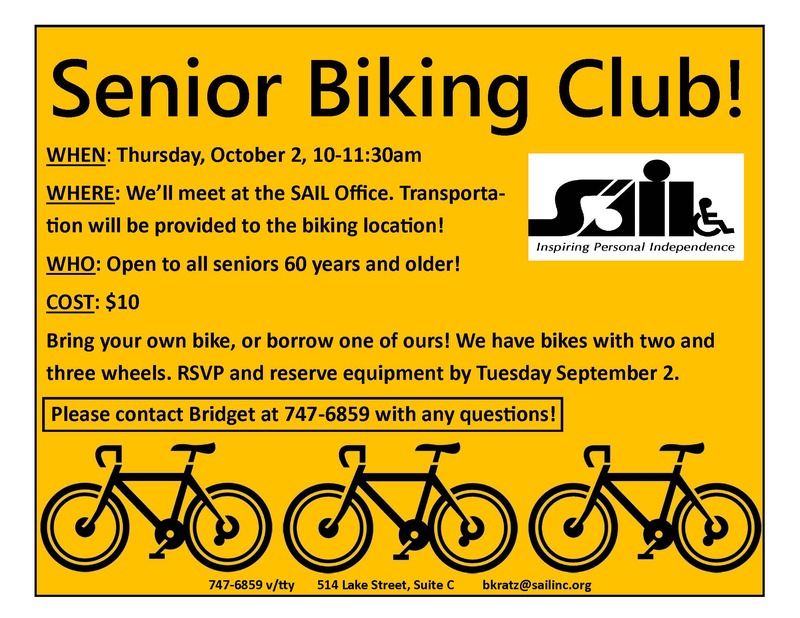 The Sitka office of the Southeast Alaska Independent Living, Inc. (SAIL), will host its monthly ride for its new Senior Biking Club for those 60 or older at 10 a.m. on Thursday, Oct. 2. Meet at the SAIL office at 514 Lake St., and the ride will start from there. The Senior Biking Club is modeled after SAIL’s Senior Hiking Club. The biking club costs $10 per person, and cyclists can use their own bikes or reserve one of SAIL’s bikes for the ride. SAIL has two-wheel and three-wheel bikes available, but you need to reserve them by Tuesday, Sept. 30. 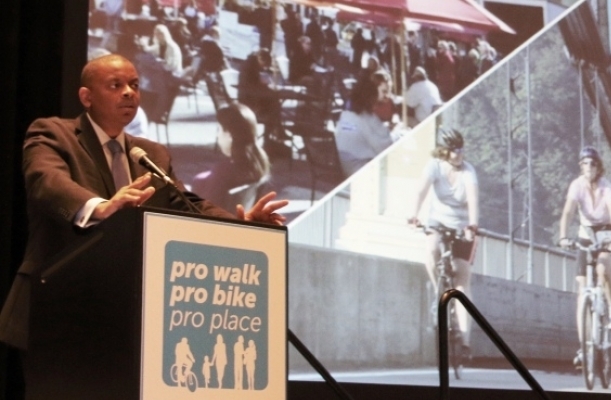 After seeing recent increases in the numbers of pedestrian and bicyclist injuries and deaths, U.S. Secretary of Transportation Anthony Foxx announced a national pedestrian and bicycle safety initiative during the Pro Walk/Pro Bike/Pro Place Conference held Sept. 8-11 in Pittsburgh, Pa. 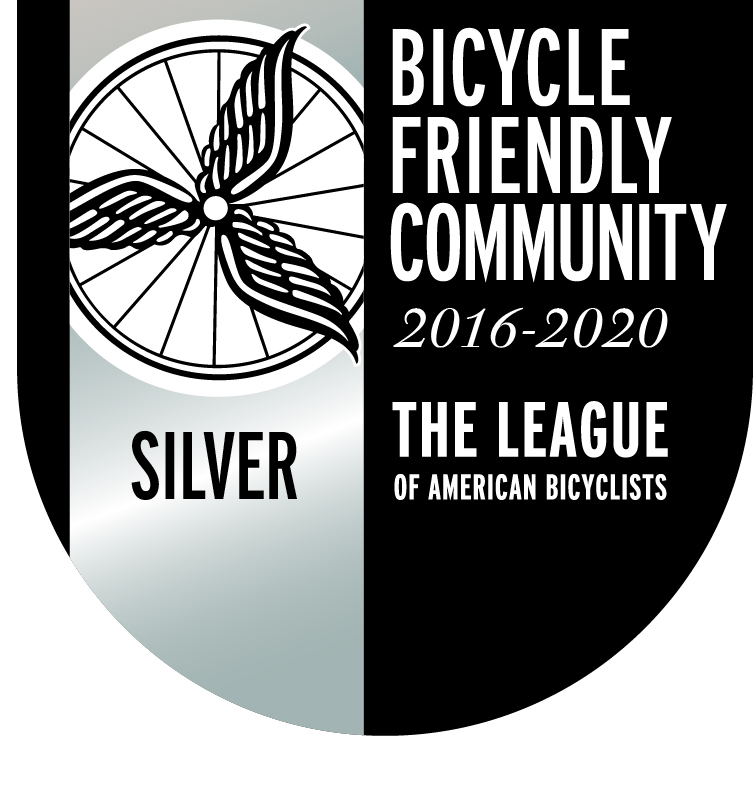 The Safer People, Safer Streets Initiative will try to improve biking and walking safety by providing better infrastructure. It also will provide research and tools for local governments, transportation planners, and active living advocates, so they can make their communities safer. The plan includes assessments in every state to determine what needs to be done to make conditions safer for walkers and bicyclists. Once the assessments are done, the next step includes projects such as building protected bike lanes, building better trail networks, and even building basic sidewalks and pedestrian traffic crossings in areas where they aren’t available. 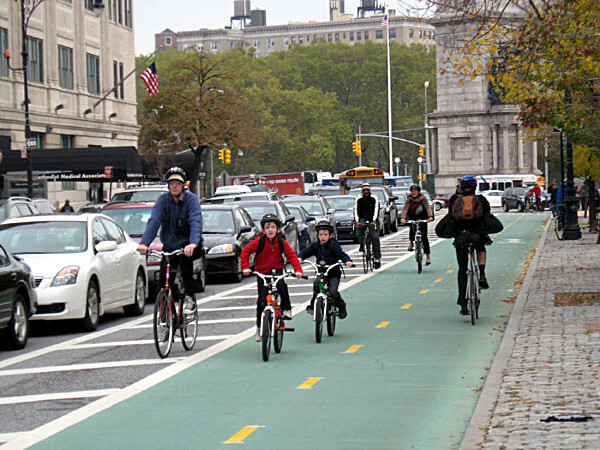 “Americans are walking and biking more and more, not just for kicks, but for sensible transportation,” Foxx said. “When President Lyndon Johnson established DOT, he said ‘keeping the traveling public safe from harm’ should be our top priority. So when we talk about ‘the traveling public,’ we must include pedestrians and bicyclists. If you are walking or bicycling, you should know that your safety is every bit as important —and just as much of a concern to the U.S. Department of Transportation — as the safety of an airplane passenger, a transit rider, or someone in a motor vehicle. But that’s not good enough. We can’t just tell pedestrians and bicyclists, ‘Be safe,’ without recognizing that in many places there is no safe space for them to be. After all, we don’t only tell drivers, ‘Just drive under the speed limit.’ We don’t just tell ship captains, ‘Don’t run aground.’ We make sure our highways are well-paved and well-marked, and that our sea lanes are navigable. For the most part, walking and biking advocates welcomed the initiative. But they also feel it needs a solid financial commitment from Congress to work. The following quote is from a press release from the Rails-to-Trails Conservancy (RTC). Join us for the eighth annual Sitka Health Summit planning day, which takes place from 8:30 a.m. to 4:30 p.m. on Friday, Oct. 3, at Harrigan Centennial Hall. Over the years there have been a variety of Sitka Health Summit projects — create a local market for local fish and produce, build a Sitka community greenhouse, become a Bicycle Friendly Community, become a Walk Friendly Community, encourage more kids and families to get outdoors for recreation, support a community health and wellness center (Hames), plant fruit trees around town, get more local fish into school lunches, build a Choose Respect mural, Revitalize Sitka, the Sick-a-Waste compost project, the Sitka Community Food Assessment, and Park Prescriptions. The 2013 Sitka Health Summit projects were Together for a Meth-Free Sitka and Sitka Kitch (a project to create a community rental kitchen and improve Sitka’s emergency food storage capacity). The 2014 Sitka Health Summit will choose two new projects, which will receive $2,000 in seed money to get started. 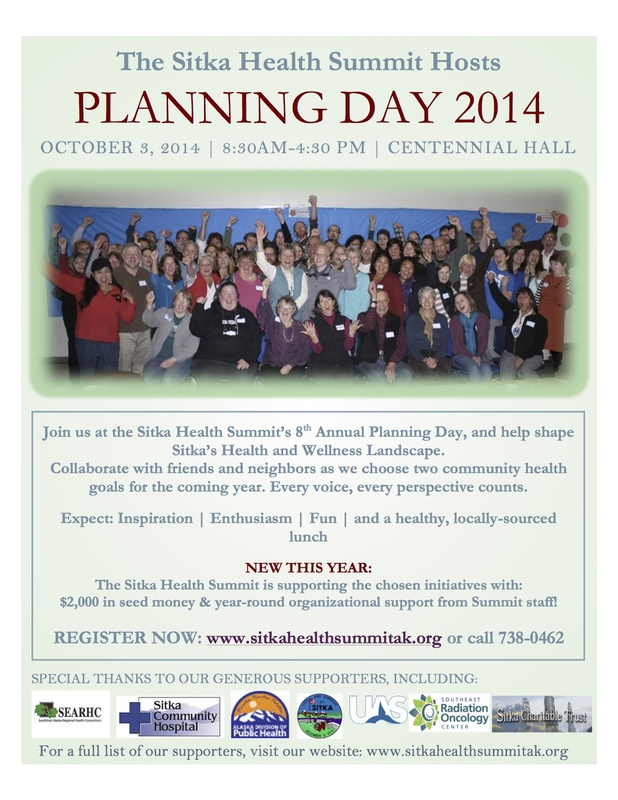 To register for the Sitka Heath Summit planning day, go to http://www.sitkahealthsummitak.org/ or call 738-0468. A free lunch with locally sourced food will be provided.